The newly re-constituted sets for Season 5 included 100s of yards of drapery and upholstery fabric! Photo by Lacey Terrell © 2016 HBO. All Rights Reserved. By slightly enhancing the sculpture, Wannop set up some great sight lines! Martin Mull. Photo by Lacey Terrell © 2016 HBO. All Rights Reserved. 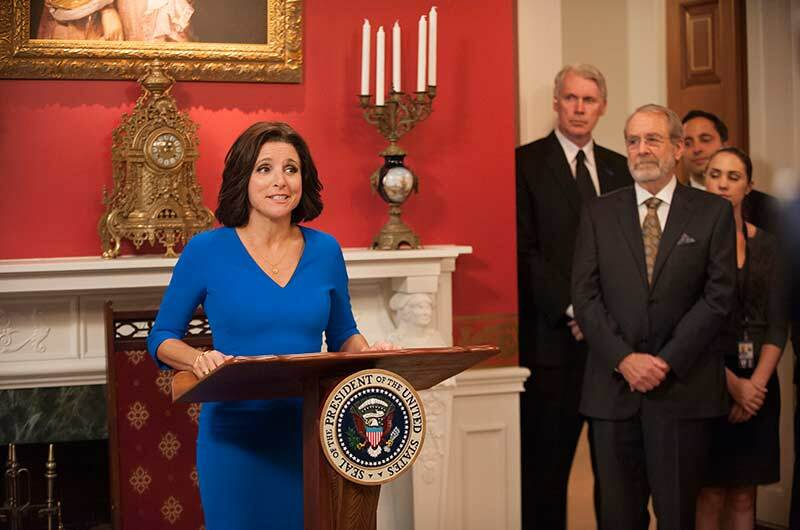 Wonder if it will change if the interim president, Selina Meyer [Julia Louis-Dreyfus] is duly elected? 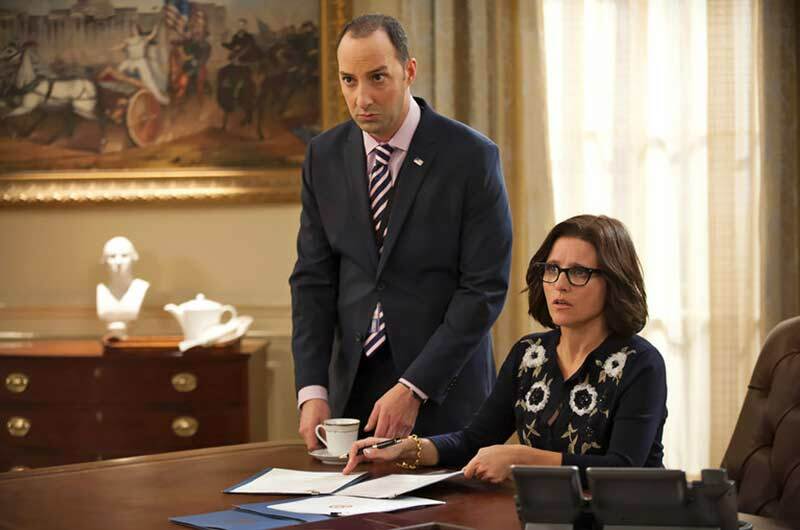 We have no doubt that no matter what, Gary [Tony Hale] will remain her devoted and beleaguered assistant! 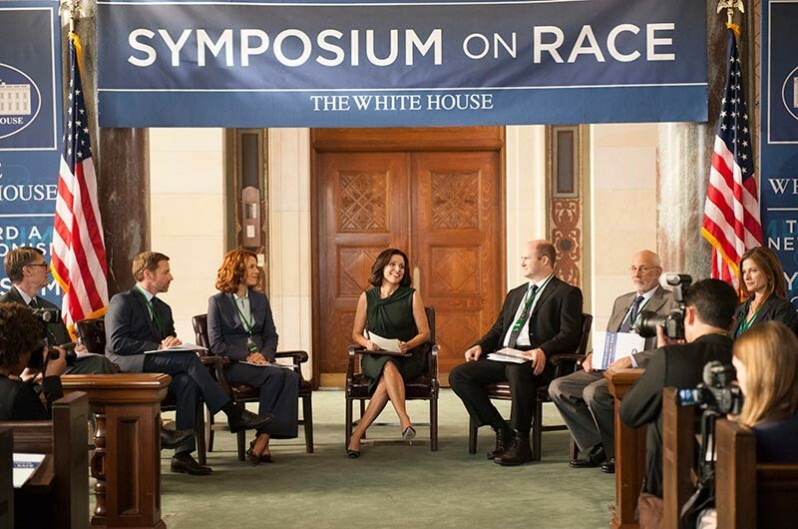 Typical of this administration, the symposium somehow had no one of color on the panel! Thank goodness someone accidentally pulled an alarm and the room had to be evacuated! As well as their extensive stage sets, the series has many location sets, though most require much more set dressing! Julia Louis-Dreyfus. Photo by Lacey Terrell © 2016 HBO. All Rights Reserved. Built on stage, the set still has the protective plastic runner in this photo. 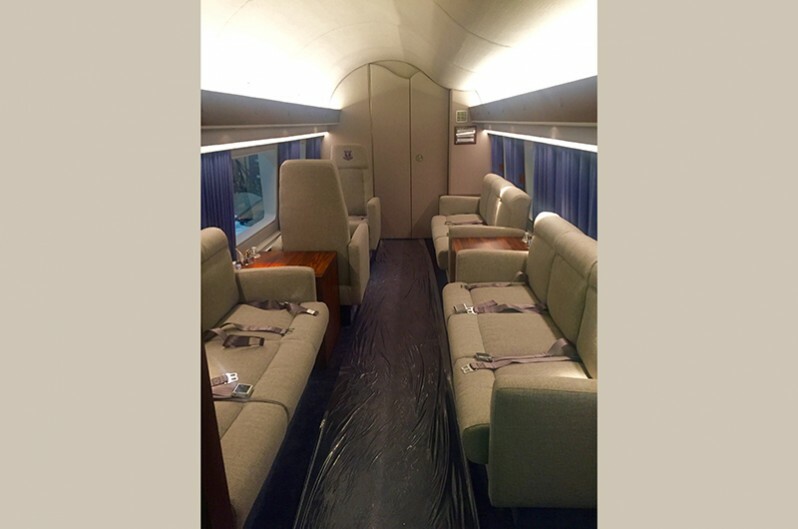 Wannop had the seating upholstered in a car-interior material that replicated the fabric in the actual helicopter. 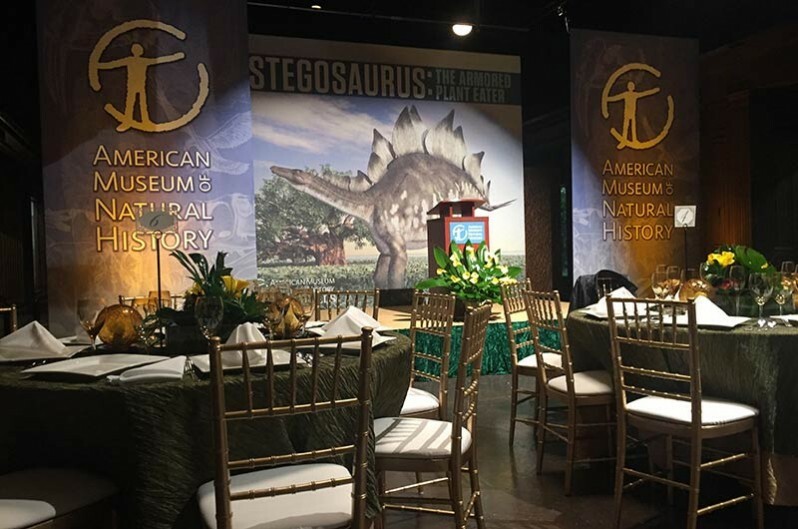 Scene of a charity event filmed at the actual Natural History Museum of Los Angeles, one of Wannop’s favorite locations! 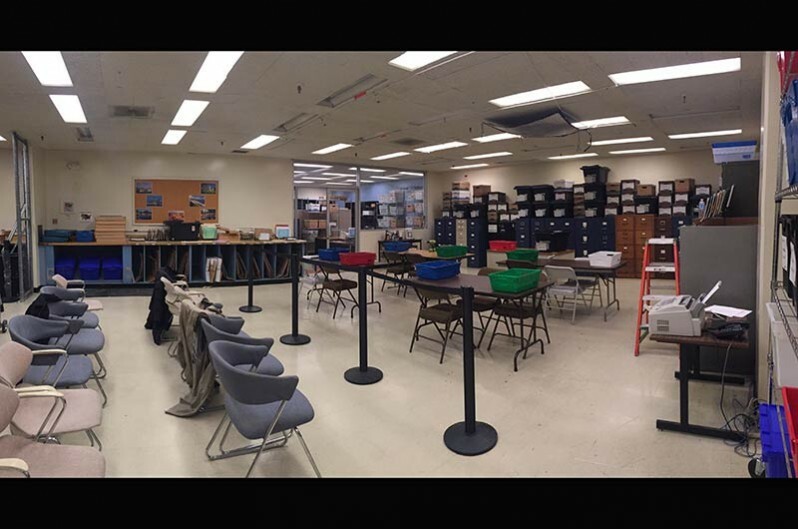 The postal center in charge of the recount is densely layered. Wannop has considerable experience creating sets of local government offices! Ready for the recount…if it’s approved by the court! The campaign slogan that says it all! Meyers’s recount team has arrived from Washington! Gloster decided the headquarters would have been set up in an old drugstore, which he built on stage! Speaking of confusion, in the usual incompetence of these staffers, the signs for Jonah look to be saying “Jon H.”! Check back at the end of the season to see if she makes it! 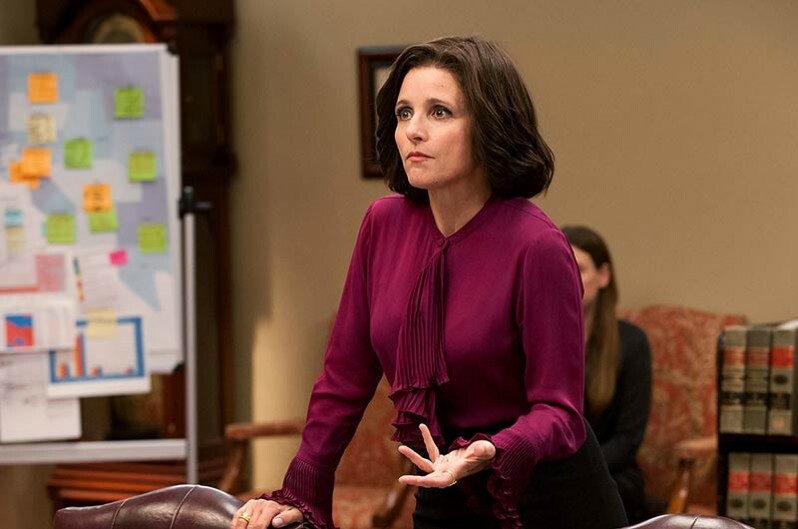 The acerbic, sardonic political satire VEEP, starring Julia Louis-Dreyfus, puts a hilarious and sarcastic spin on the machinations of Washington—although these days, the exaggerated and rather caustic POV is all too close to the real thing! What keeps it real, besides the terrific acting, are the sets that draw us in and ground the antics. We quickly get caught up in believing the extreme situations, because the White House and Washington environs are so deliciously created as reality, with a stylistic push. 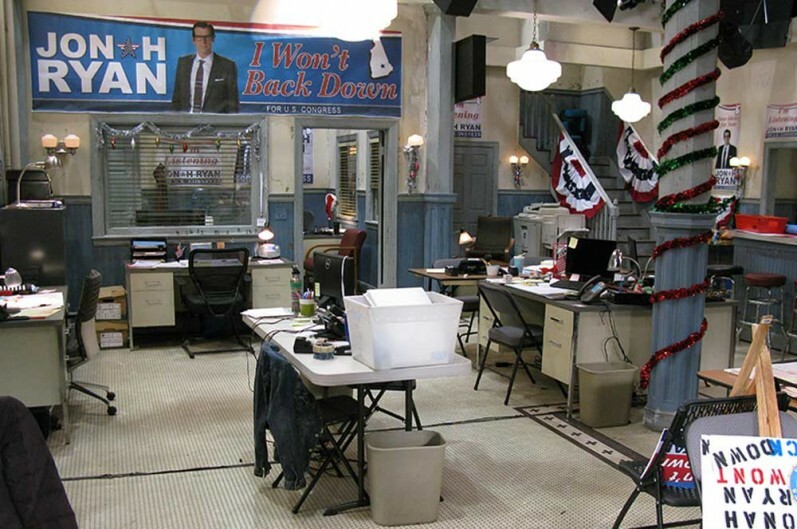 When the series moved production to Los Angeles for Season 5, Production Designer Jim Gloster wisely brought on Set Decorator Kim Wannop SDSA, who had just completed multi-seasons of the delightful comedy PARKS & RECREATION after a long stint on BONES. 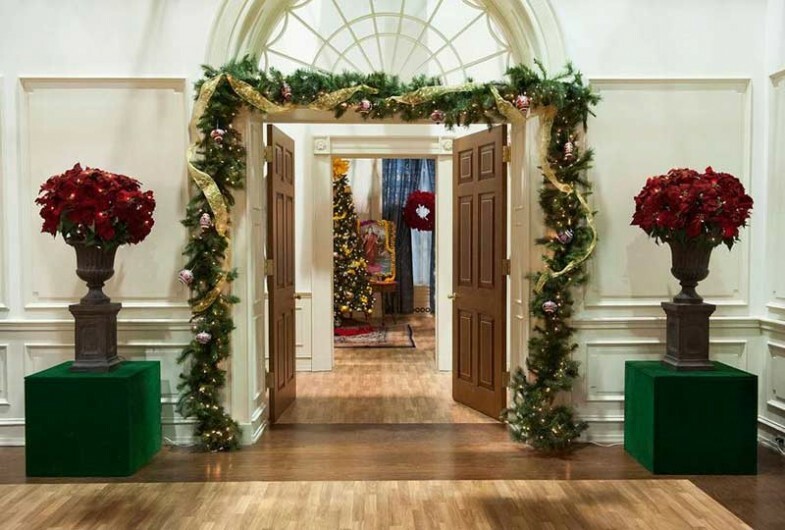 The designer and set decorator and their crews painstakingly re-built the White House sets, reconfigured slightly larger and even more detailed, and set forth to conquer innumerable new sets with the goal of keeping the fifth season not only seamless, but as fresh as the first. How do rehearsals impact your set dressing schedules? Set Decorator Kim Wannop SDSA: I have so much respect for this cast because they work just as hard as everyone else on the crew. They rehearse on some weekends and we do our best to have new sets ready or at least roughed in for them if they need to be in the space. We worked a lot of weekends this season, and it felt like they were right along with us. Wannop: I had never met Jim before interviewing with him, and only met him in person when we started the show. I was nervous to work with a new designer that had been with the show since the beginning (and because VEEP was and is my favorite show!) Jim Gloster is basically one of the nicest, calmest, talented designers I've worked with. He never gets rattled by the amount of work they throw at us and is very meticulous about details in his design from the research he does. We try to grab moments between the craziness to sit down and talk about the sets and the research. SET DECOR: The slogan associated with the show, “Continuity with Change” says it all! 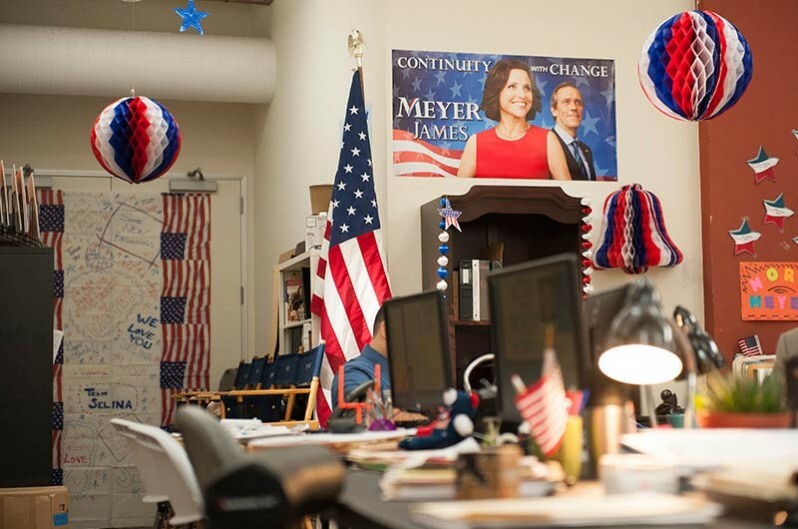 We’re thrilled that VEEP moved production to CA! But it must have been such a huge job for both of you! Wannop: I can't even express how overwhelming it was to receive all of the set dressing at the beginning. My crew unloaded 7 Sea-vans [huge shipping containers] and filled 2 sound stages at Paramount—it was like walking into Indiana Jones’s warehouse! The East coast crew that packed up the show did an amazing job detailing it all for us and we were very thankful for that. The Construction crew, lead by Matt Haynes, is phenomenal! All of the walls that were shipped had to be cut down to fit into the sea vans, so not only was construction fitting walls together, they were piecing the tops back on them, it was like a giant puzzle! 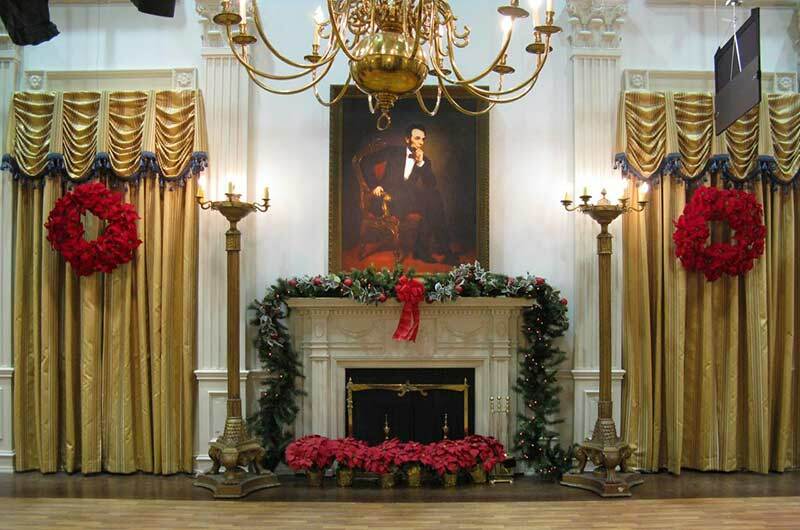 Jim had to redesign the layout of the White House to fit into the stages at Paramount, which gave opportunities for longer hallways and some of the rooms to become larger. We had 6 weeks of prep, but then the show pushed a week and I do believe everyone was thankful for the time to get everything just right. 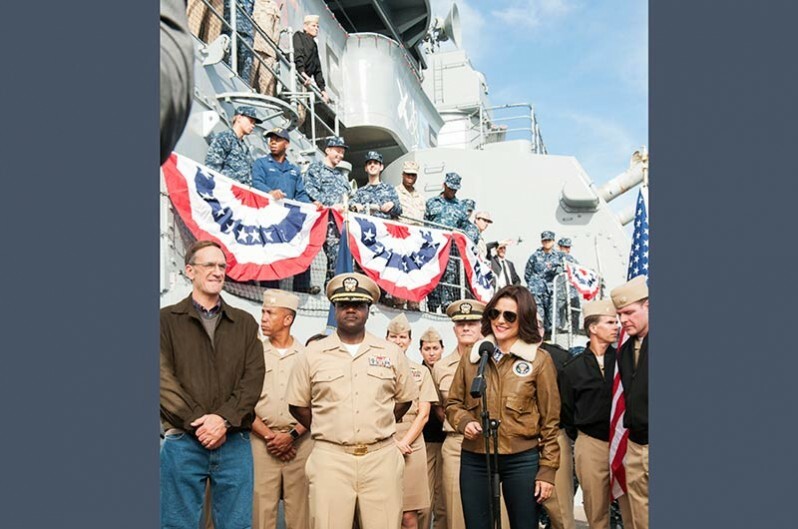 It was so rewarding to see the faces of the cast and the crew that had been on the show in Baltimore walk onto the sets and see their amazement. 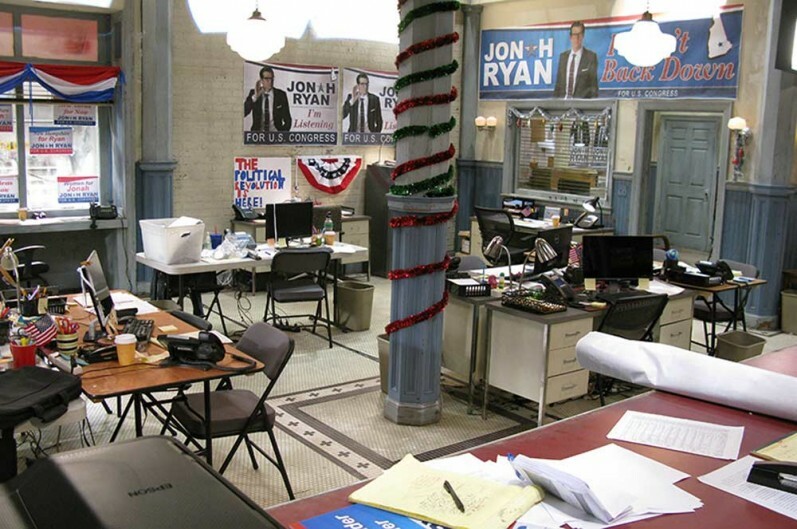 SET DECOR: You did the beloved series PARKS & RECREATION, which was set around local politics and then expanded to regional for the final season. And now you’ve jumped into the White House and the DC environs! Wannop: Yes, I only work on shows with a strong female political story, how timely! Haha. I am so blessed to be a part of these shows, especially because I love both of the shows as a viewer. Government seems to have the same look no matter where it is—it's messy, it's a little boring and, as I say, a "State-issued" look. 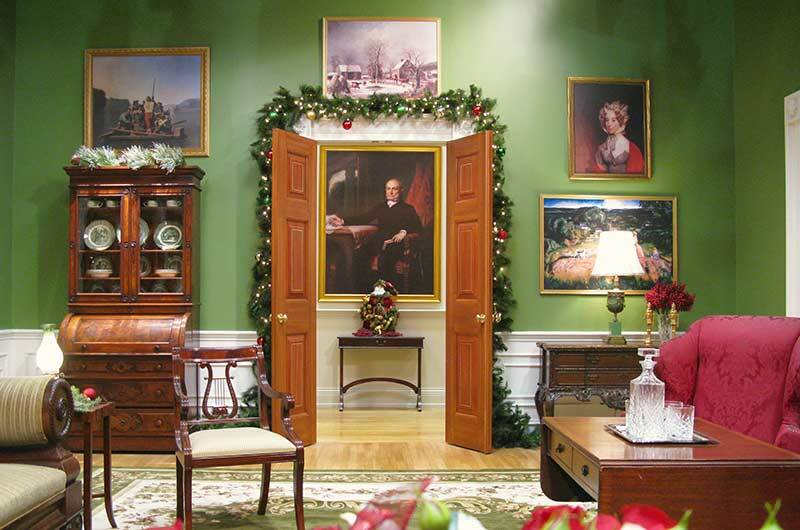 But to get to do the White House and Oval Office, I'm sure many of the decorators that have done these sets would say, it's special, it's grand, it's THE office and you are re-creating a look that all Americans are familiar with. 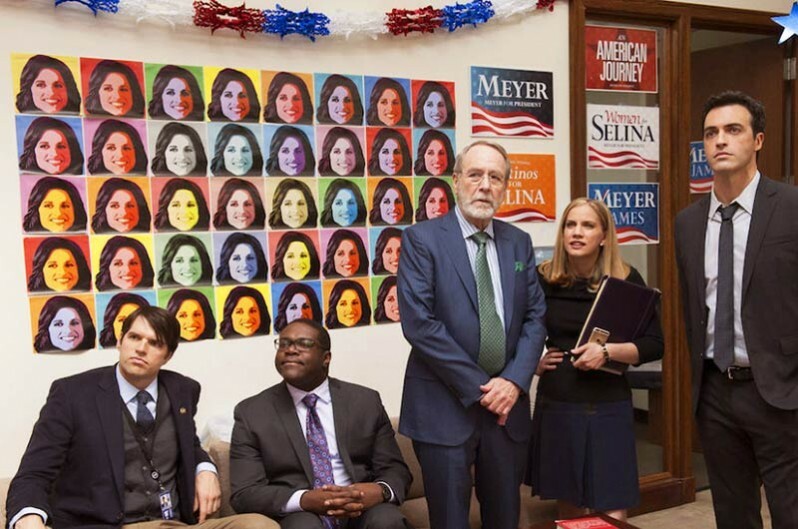 The best connection between PARKS and VEEP in the dressing is the realism that both shows have. Yes, there is a share of pristine-looking sets but the majority are character/scene based sets in government that aren't really pretty. I love doing layers of extension cords, paperwork, office supplies because that's what it really is…but invoking character into these sets is the challenge and the pleasure of the job. Wannop: So much fabric!! I love it, love collaborating with Jim on paint colors and fabric to make the rooms look cohesive. We had some very big jobs for WB, Omega and Universal** this season. In fact, some times we were having all three of them working at the same time for the same sets because of our quick prep time. Deb Jones is a drapery angel, or a drapery whisperer, I can't decide, but I could not have gotten through the Green Room, Red Room and State Dining room without her guidance. 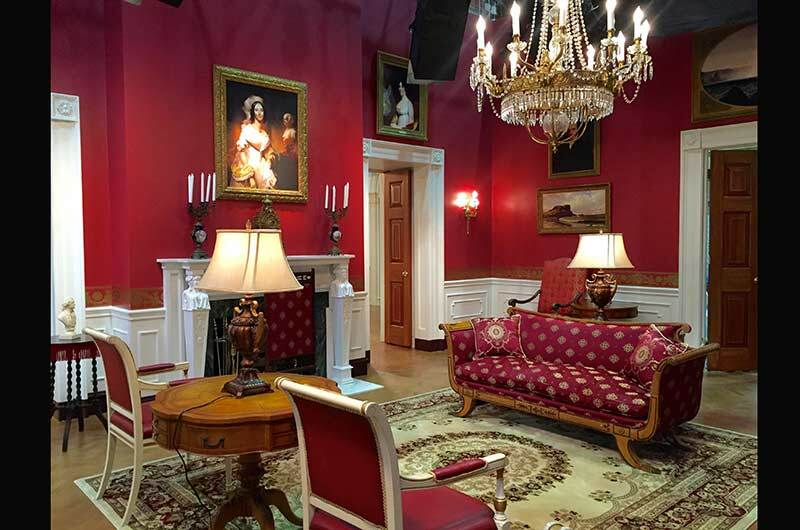 For the Red Room, I was able to reupholster furniture from WB, with Robert Greenfield's blessing, to match the drapery, which was so helpful in getting the room the authentic look. I reupholstered a lot of the furniture that was sent from Baltimore so that I could keep the same feel of the furniture style but update the look. SET DECOR: We LOVE all the florals, the variety and the different moods that they create. How do you decide that week’s/room’s floral palette and architecture? 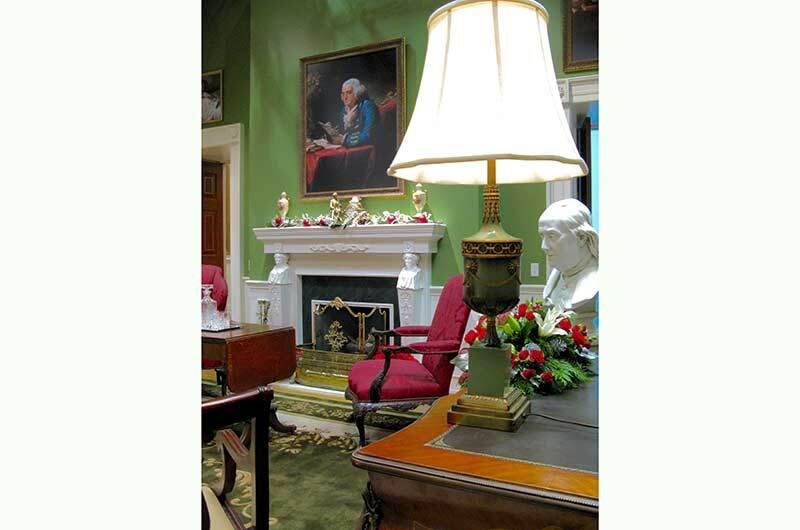 Wannop: In my research, I discovered that the White House has its own floral staff and floral room! 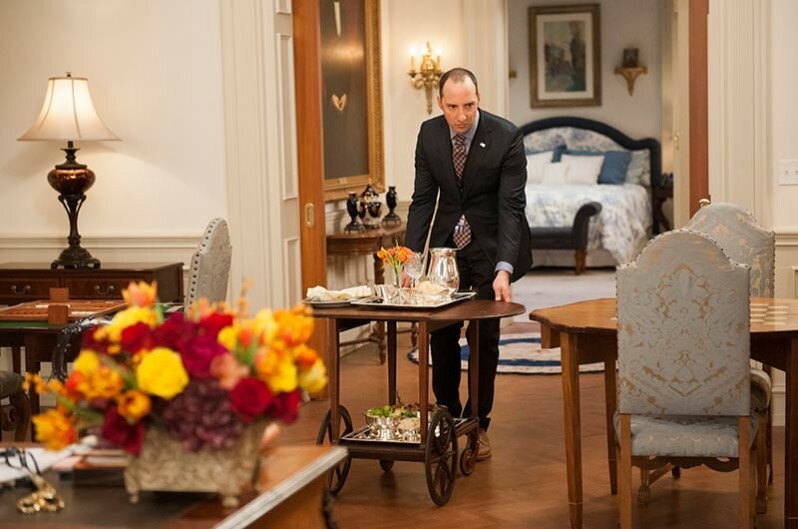 I love having flowers around the White House sets because it shows a bit of grandness and gives pops of color. 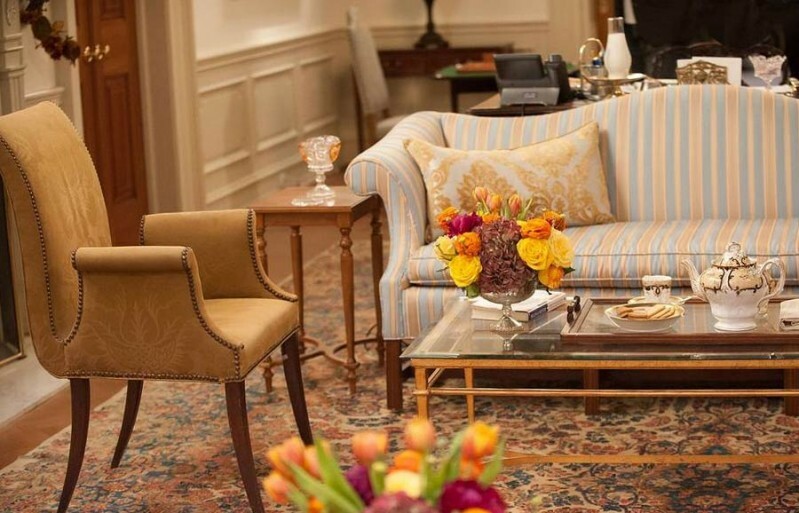 I keep tulips for Sue's desk, and seasonal arrangements throughout the West Wing and residence. Since our storyline went through the Fall/Winter season, I tried to reflect that with both color and the appropriate flowers, greens, branches and grasses. I researched what was in season at that time of the year and previous White House florals. It’s important to me to use fresh flowers…it makes such a difference for the look and also for the actors to experience. The changing out of the flowers was often tricky. Since we sometimes cross-boarded episodes, or would be on location for days and then come back to stage to shoot, it became a job in itself just to keep it all straight. I would re-order arrangements weekly to keep them fresh. I've been using the same florists for about 10 years, I send them pictures of exactly the arrangements I want and they copy my instructions, and manage to always deliver in time! SET DECOR: Most shows have one corridor and dress it in different ways to cheat it out as yet other hallways or someplace else entirely. Jim has built amazing corridors with nooks and offshoots – such a creative way to make it look more real, and we would imagine, offer more accessibility to camera. Do you change these out often? 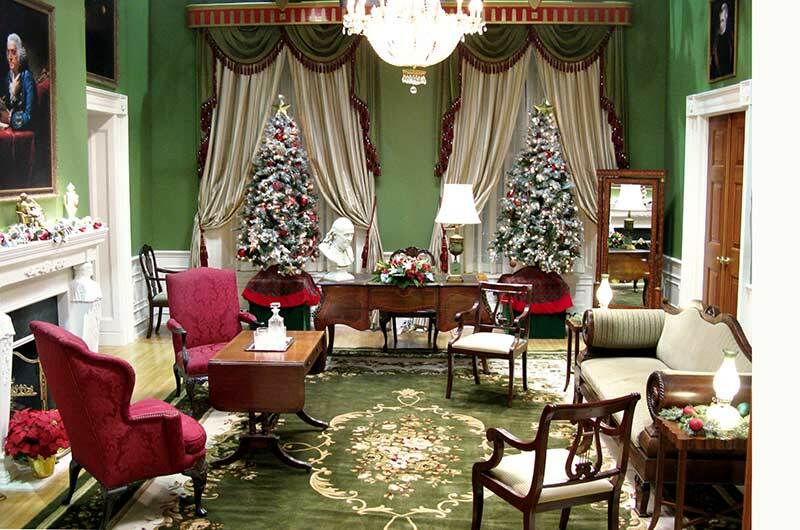 And tell us about set dressing for narrow White House corridors and the wee offices tucked in! Wannop: We do change over the hallways almost every episode. I had drapery panels made at WB to switch out the windows, and we have art and furniture assigned to different looks. I hate to scramble, so we try to prepare as much as we can for an unexpected change-up. 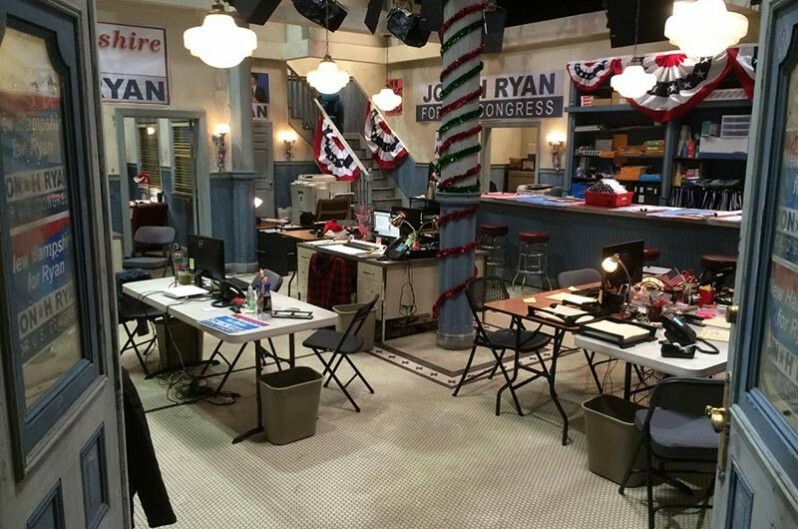 Jim has used every inch of the stage in changing offices and hallways all around, but you'd never know it’s all the same set. 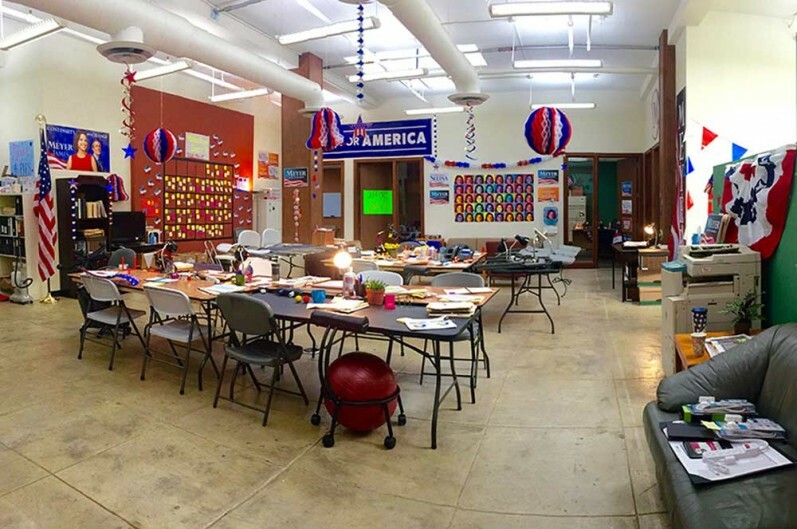 SET DECOR: So many of the scenes have several characters on the set at once! How does that impact set decoration? Wannop: I can say that when we scout a location or talk about a set and the director says, "I'm never going to look that way" ... Umm, they will, especially if there’s more than one actor in the scene. It's very rare that we do a three-wall set, so I just always dress for them to see it all. 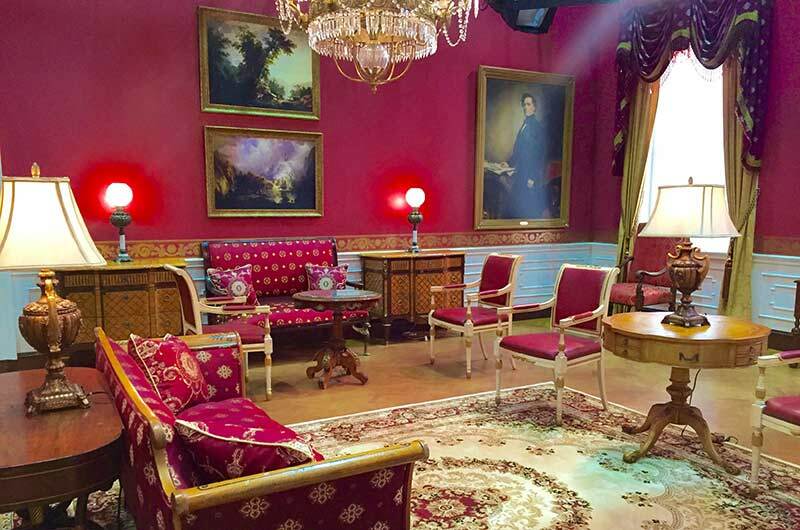 SET DECOR: Could we talk about the various White House sets, for instance the Green Room? Wannop: My favorite set of the season! It's not an exact floor plan because of the set size, so furniture had to be re-thought for the scenes, which was exciting to do. I bought pieces from EBay, etsy, flea markets and Wertz Brothers, framing from Hollywood Studio Gallery, and did chair rentals from Omega. The sofa I found on Craigslist for $300! And it was a perfect green shade! Didn't even have to reupholster…probably the only piece that applies to. 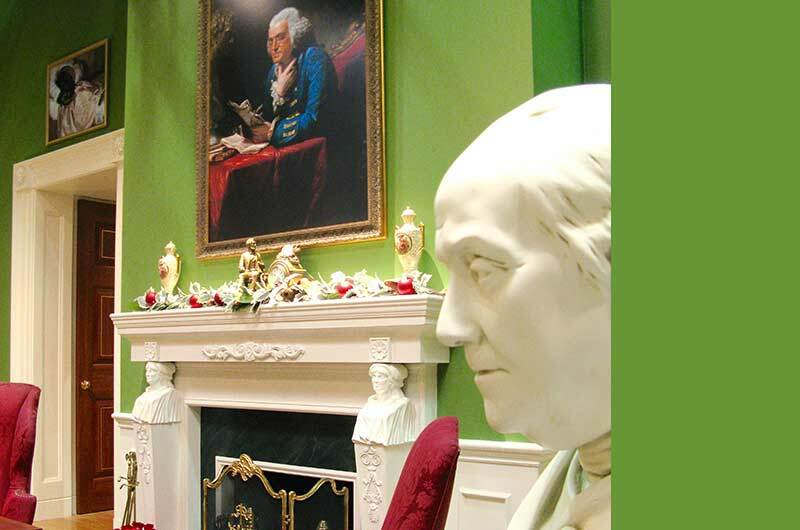 I also have a large bust of Ben Franklin in the room on the desk, larger than what exists in the real Green Room. I felt like it was an opportunity to emphasize sculpture in the room. His portrait is also over the fireplace, which I think is one of my favorite pieces in the sets. 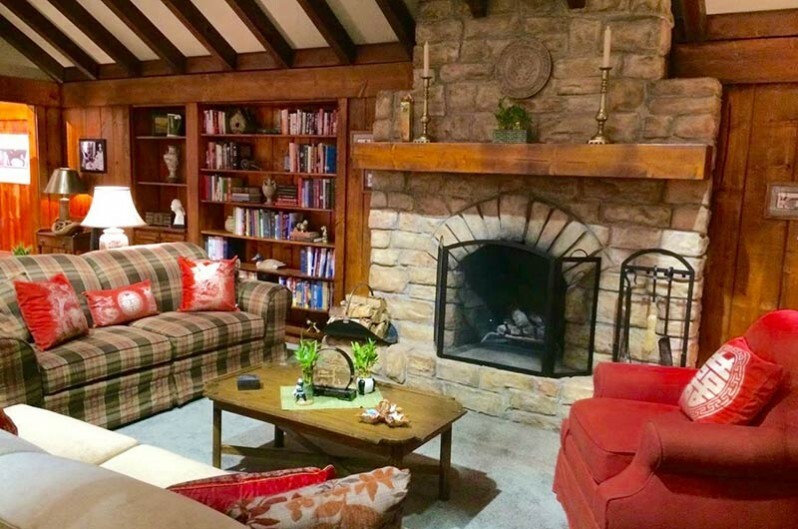 This set played in the first two episodes, so I had little time in the beginning to research and then reupholster furniture. It was a lot of research and a challenge to get the elements, especially to get the rug just right. I found a similar rug to the real one online at erugs.com and with our season pushing, thankfully, I had the time to get it. I also found the perfect fireplace screen at Wertz Brothers and had WB insert the fabric that matches the sofa and drapes. 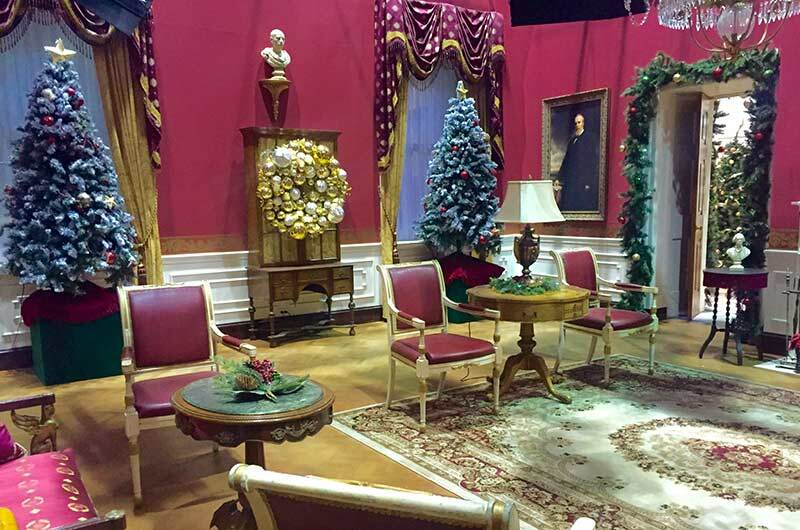 This set was a re-work of the residence sitting room, we dressed it for Christmas on our return from the production’s Christmas hiatus, which you would think it would be easy to do Christmas after Christmas. Nope. Oh yes, we had an explosion of dressing including all holidays and religions! I believe we had 5 visible holidays in the episode. I actually divided and conquered them with my buyers Sondra Grossman and Karen Riemenschneider. This was shot at a location in a previous season and the toile look was part of the location. So to match it, I found the same blue toile fabric, ordered about 150 yards and had the drapery, bedding, pillows and a coordinating chair made. It's toile heaven! That might have been the easiest set of the season, shot in a hallway below our stages. The joke was in the minimal set dressing and old office supplies in the hallway to show his descent from politics. There was a story line about the Chinese diplomatic visitors having to switch cabins with the First Family because the layout of their cabin was unlucky. 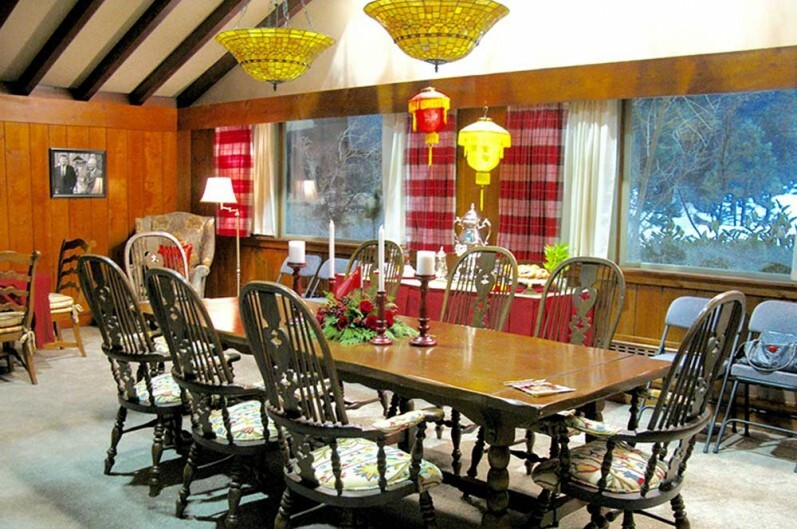 Jim designed the one cabin to have two looks, then within that I would redecorate the Chinese vs the Christmas look in each cabin. Confused yet? Cause we were. We had to change the set overnight, then do reshoots and guess what, they dropped that story in the final edit. Soooooo, the fun part was the exteriors we shot up at Lake Arrowhead. It was beautiful! My on-set dresser Jorden Steinberg does an amazing continuity job and he's very creative with the frame. I'm very thankful for that. Jim designed the Marine One from the research he had amassed. Universal drapery coordinated with our construction crew and did a fantastically quick job, with all the panel walls and the seats. We had a week to have it made. I selected a type of car interior upholstery to match the real Marine One. And, of course, the Presidential seal had to be included. Not the White House but we saw this set on stage – it was incredibly realistic! 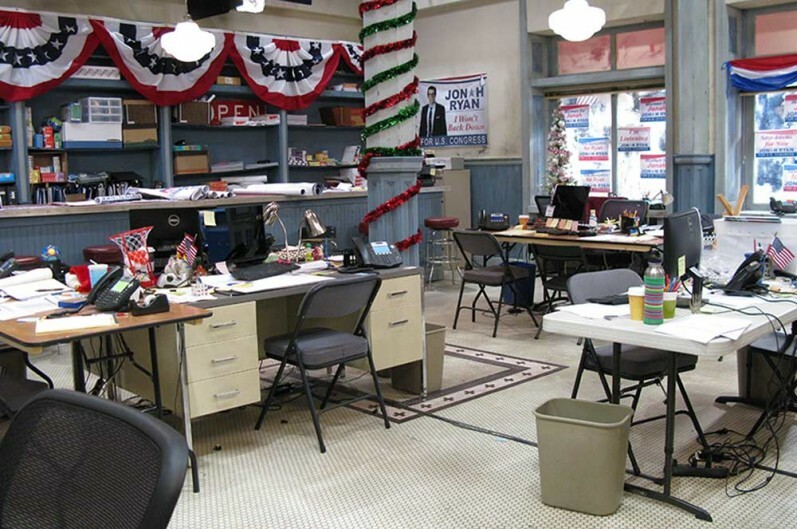 Jim's brilliant idea to have the headquarters be in an old run down drugstore offered a huge look difference from the rest of the show. The paint crew aged the set perfectly to give it that extra layer of character. It also gave me an opportunity to dress a rundown drug store and then layer the campaign on top. 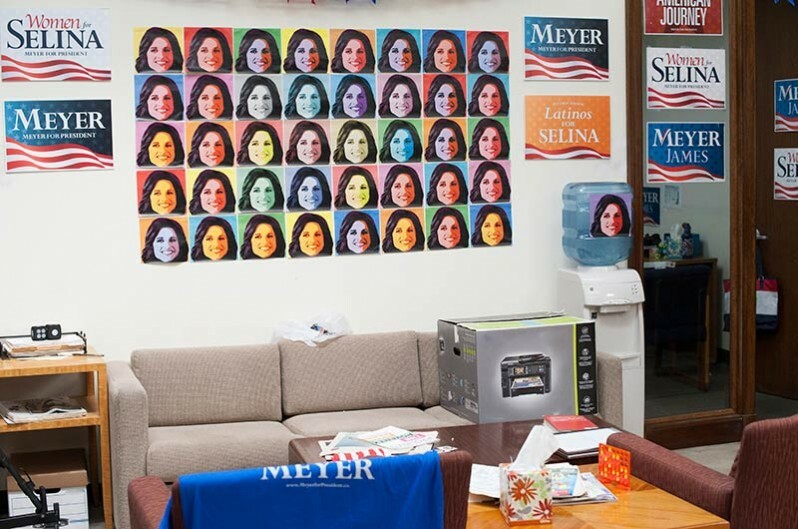 Jim really wanted to show how city campaign offices show their enthusiasm for candidates and made up the Warhol-inspired art. We did a wall-sized calendar to show how volunteers sign up for their assignments. We also wanted to show how chaotic these offices are with the use of power strips and Internet cords everywhere. 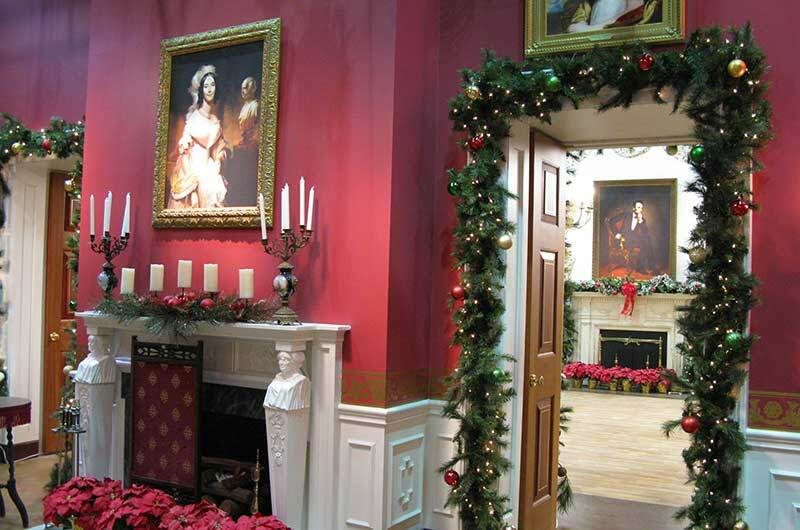 SET DECOR: These sets were built onstage at Paramount Studios, but you also do a lot of locations. Do you have more than 1 per episode? Wannop: Yes, sometimes multiples in one day. When we shot at the Biltmore hotel, we had 5 full dresses in one day. The White House mess, Mike's hotel room, the Vice President’s home, Mike's kitchen, and a senator’s office…It's a very heavy swing set show. We’ve shot downtown, Hancock Park, Hollywood, etc. and are out an average of 3, sometimes 4 days an episode. For example, the Nevada postal center where the recount is held was a huge dress for us on location, another day of 4 full dresses at one location. 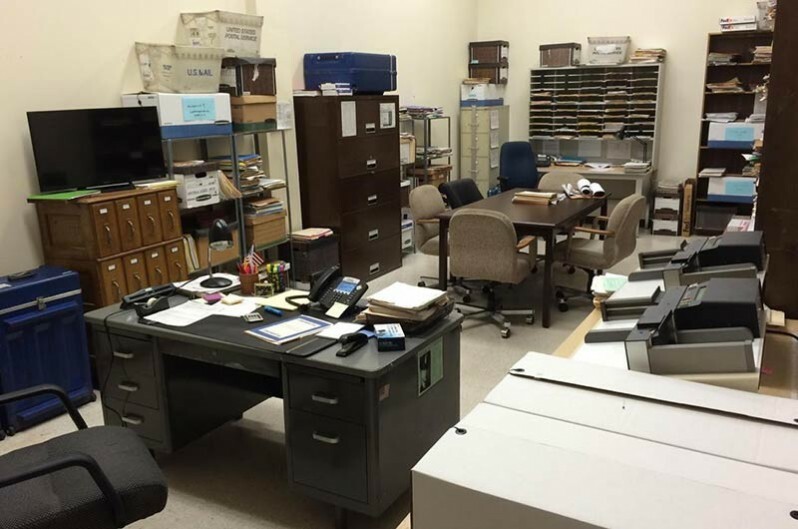 In researching recount offices, there isn't much official-ness to it. It's usually just set up in a county file room. We needed the room to look dense and show a flutter of activity. Gay Perello, our prop master, is so fantastic with making the characters’ props look official and authentic. In this and every set, she takes the time to detail out what the action is, including in this very busy scene of hundreds of ballots being recounted. And then sometimes you just get a fantastic location like the Natural History Museum of Los Angeles! We were doing our own Museum of Natural History, which we dressed as a dinner charity event. I rented from Town and County and WB, and the exotic floral arrangements are by Sonny Alexander. Wannop: My crew is amazing, and I cannot stress that enough. I know all our shows are getting harder and harder and we depend on our crews so much. Patrik Alven has been my lead since PARKS and he is simply the best. Hands down, no contest and I am never letting him go. Set Dresser Dave Michel is essential to our crew. He's the first in and last out and really cares about what's happening every day and every set. That’s just how our guys are. I've been with a lot of my guys since BONES. I had Sondra Grossman as my perm buyer this season and she rocked it, always on top of it. We had a slew of swing guys and second, third buyers. I can't thank everyone enough. SET DECOR: What has been the biggest challenge on this project? Wannop: Time. I just want more time to research and get the right pieces. I respect the show so much, it deserves the best. SET DECOR: Anything easier than expected? Wannop: I really can't say anything was easy on this show. Not in a bad way, but it's just a demanding schedule in every department. We had 43 swing sets our last episode, 8 sets a day. I know it all won't make it to air, but my whole team worked very hard to have everything camera ready. Wannop: The understanding of my producers, especially Morgan Sackett, to let us get it right. They are very supportive and appreciate our efforts. SET DECOR: Was there something particular that you learned on your last two big series that you brought to this one? Wannop: Take it one set at a time while multi-tasking the rest! SET DECOR: Anything particular you’ve learned from or were gifted with on this one? Wannop: Very gifted to be working with such a talented designer and the support of my perm crew. SET DECOR: And what about next season????? Wannop: It's all hush hush till the finale! 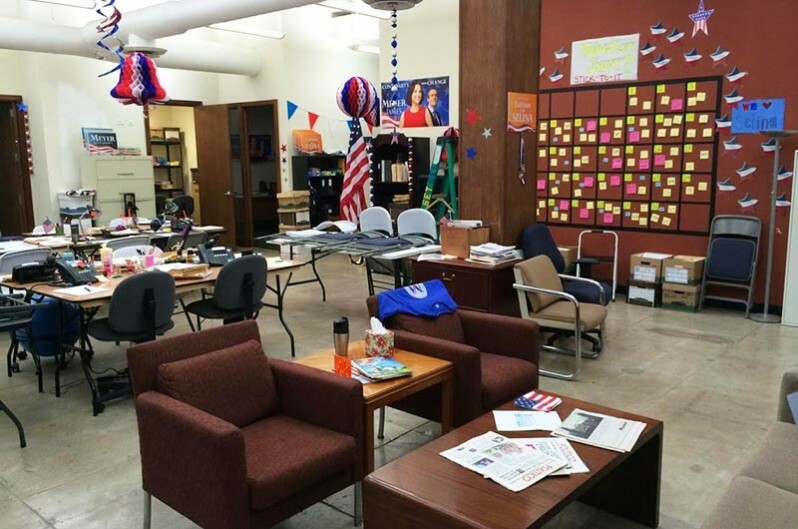 Set Decorator Jan Pascale SDSA did the VEEP pilot with Production Designer Clayton Hartley. Set Decorator Tiffany Zappulla SDSA, did the first season alongside PD Laura Ballinger, and the second with PD Jim Gloster who had been the series Art Director. Zappulla then moved on to help create HOUSE OF CARDS. Set Decorator Jennifer Engel took over for the third and fourth seasons. Then the production moved from the East coast to Hollywood, and Production Designer Jim Gloster brought in Set Decorator Kim Wannop SDSA to help bring it back to life and jump into entirely new sets on stage at Paramount Studios and locations throughout the Los Angeles area. While on hiatus from VEEP, Wannop is currently filming the new season of Judd Apatow’s LOVE!